Are you aiming to be a teacher? Whether it is the right career prospects you are looking to know or the Teaching Job Opportunities, here you can get them all at one place. 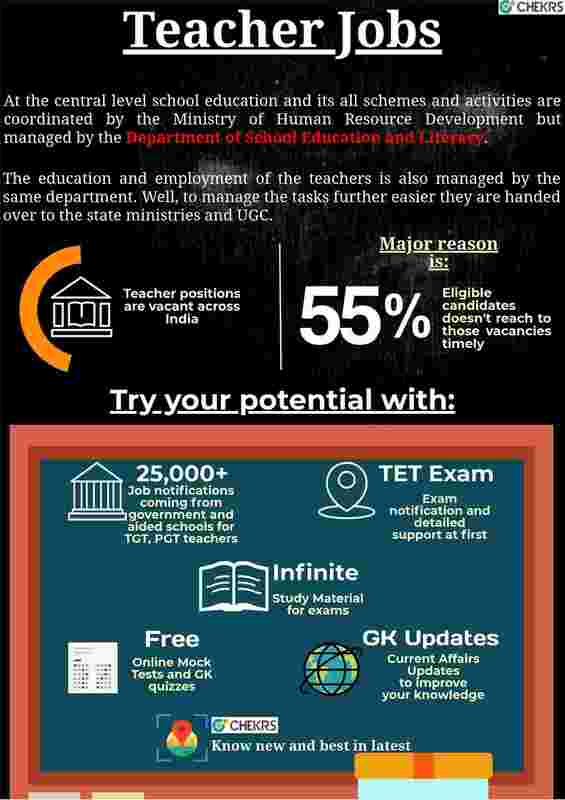 At Chekrs we provide you complete Latest Teacher Vacancy 2019 insight to leverage right decision. In fact you can stay updated every time for Latest Govt Teaching Jobs 2019 by taking subscription. The team of Chekrs searches out all possibilities that can interest you. To help you excel in your aim of Teacher Govt Job, we list down best Govt Teaching Jobs for B.ed, CTET, Btech, Graduates, MCA, 12th Pass and many more. Based on your interest group you can access the Govt Teaching Jobs in Rajasthan, Delhi, Punjab, Chandigarh, UP 2018, etc based on your preference. You can also filter the jobs based on its immediacy factor. Why Chekrs for Teacher Job Vacancy? Along with informing you about the Teacher Bharti 2019 we also maintain out assistance in the complete selection process. Though the selection is not easy, we give your free and easy to use study material. You can improve your preparation by solving previous papers, taking online mock tests and also the daily quizzes on GK.